Iron Maiden have launched their own Trooper beer brand. The group have teamed up with Cheshire family brewers Robinsons to create the new beer, named after one of Maiden’s most popular songs, “The Trooper,” from 1983’s “Piece Of Mind” album. 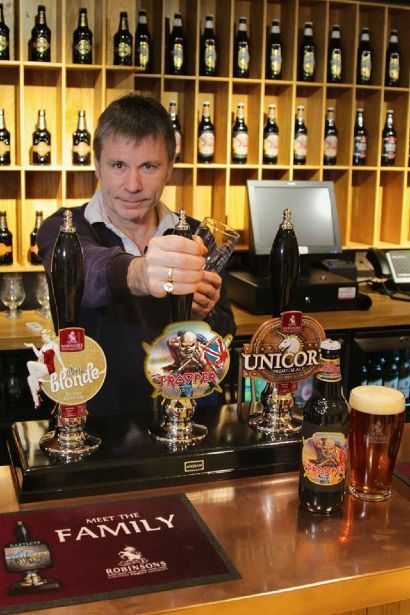 Real ale fan and history aficionado Bruce Dickinson, Maiden's vocalist, played a major role in developing the unique flavor of the beer, entailing ongoing visits to Robinson’s brewery in Stockport. "I'm a lifelong fan of traditional English ale,” said Dickinson. “I thought I'd died and gone to heaven when we were asked to create our own beer. I have to say that I was very nervous: Robinsons are the only people I have had to audition for in 30 years. Their magic has been to create the alchemical wedding of flavor and texture that is Trooper. I love it." Robinsons has been brewing award-winning beers from its Unicorn Brewery in Stockport for 175 years. Best known for its legendary "Old Tom" strong ale, which was voted "World's Best Beer" by the international Beers Of The World publication, it is Robinsons' younger ales (Dizzy Blonde and "Build A Rocket Boys!" beer; produced in partnership with Manchester band Elbow) that have lately been causing a stir in the beer world and introducing future ale drinking generations to Robinsons. Fans of both Iron Maiden and real ale can sign up to get news and updates on Trooper Premium British Beer from www.ironmaidenbeer.com, where bottles will be available to purchase by both U.K. and overseas customers from May 2013.